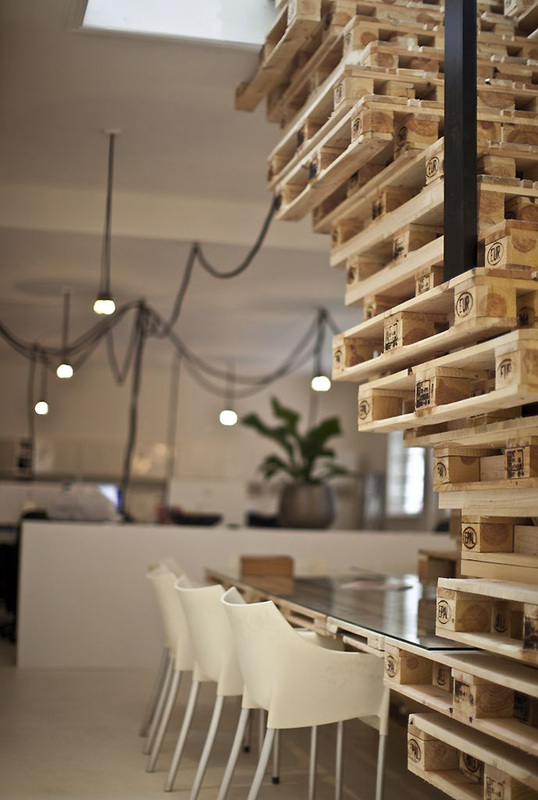 Here is Amsterdam advertising agency BrandBase’s minimal look completed with wooden shipping pallets to create interesting structures and furnishings, built by MOST Architecture for this eco-friendly project. A temporary furnishment for the new office location combined with the explicit wish to furnish the space with an authentic, recycable material, gave creative director Marvin Pupping and MOST Architecture the idea to use Euro-pallets for this particular design. 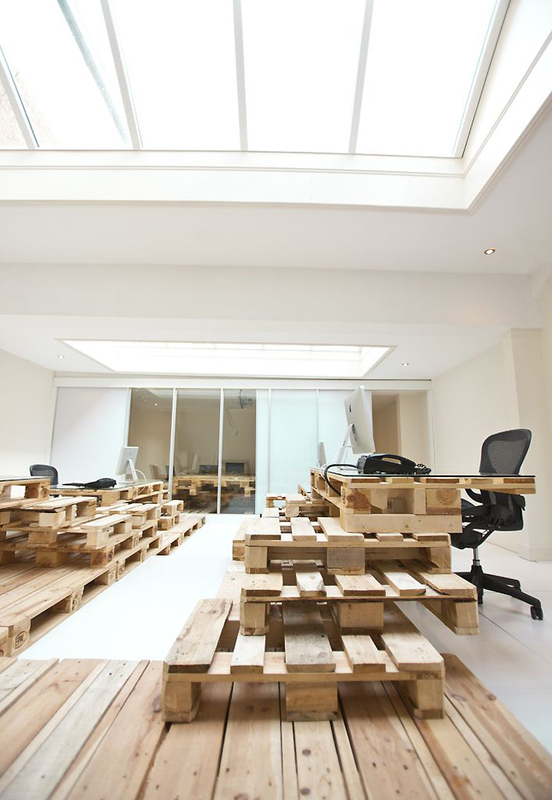 The pallet structure; an open, autonomous landscape that gradually changes its character, facilitates all parts of the office. 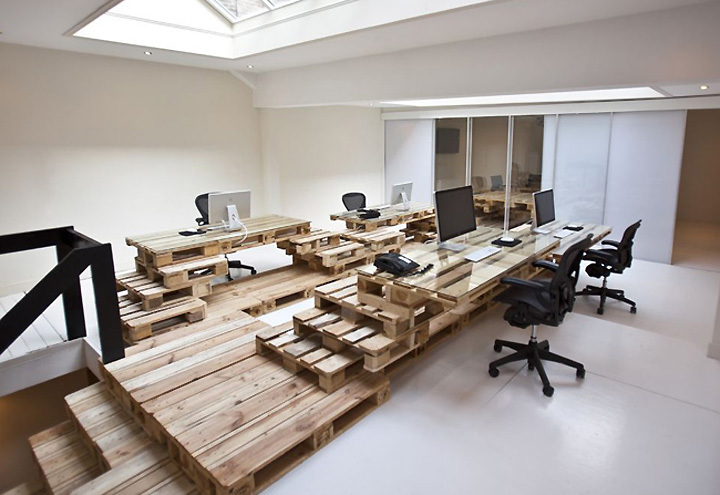 The pallet structure is designed in such a way that besides being merely a workplace, the entire element invites you to stand, sit or lay down on the pallets. 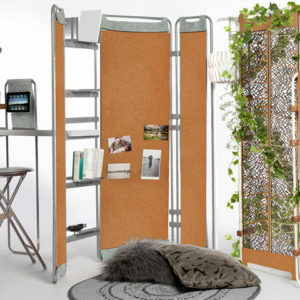 This open office concept was created to suit the creative advertising agency, with an additional, informal atmosphere. The existing building on the Brouwersgracht, downtown Amsterdam, is an archetypical Dutch canalhouse; a narrow, 27 meters deep space, with a back area that is divided by split level. Because of this, the concept for this dynamic company was organised along the longitudinal axis. 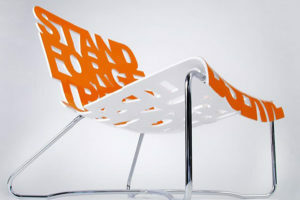 And because of BrandBase’s specialty, it was mandatory to include new media. From the very start of the project, the design development as well as its execution, had followers from all over the world through the project’s Facebook page www.brandbase.nl/thepalletproject). 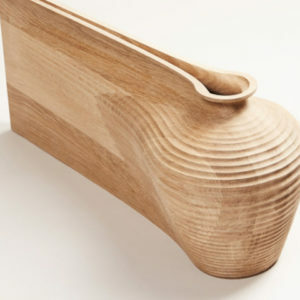 The design concept, an open autonomous landscape, consists of 3 layers. The first layer, the existing space was used as a starting position and painted completely white, to provide a homogeneous base for the pallet structure. 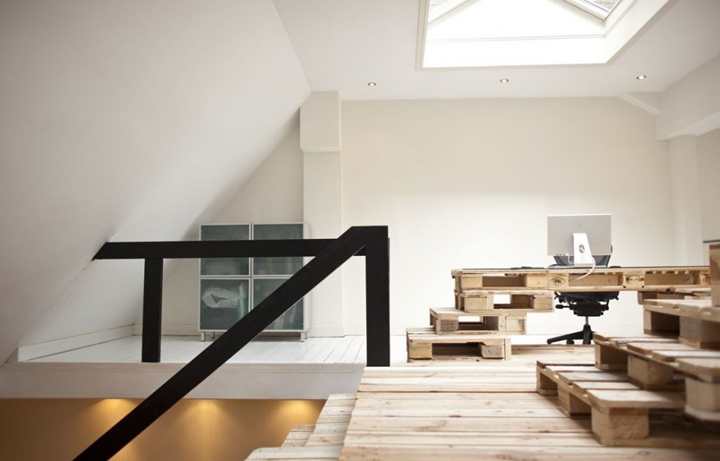 The pallets itself create a structure that slowly changes its character accommodating all parts of the office. 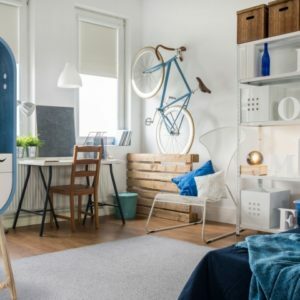 Finally, the third layer in the design contains additions to the pallet structure like light fixtures, staircase banisters and the furniture; which are all done in black. The structure is not dictating, rather facilitating. 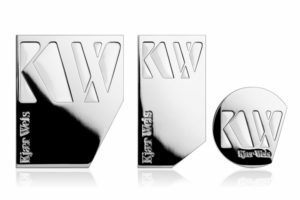 The open character is enhanced by dispositioning the pallets both directions over a 20 cm grid. 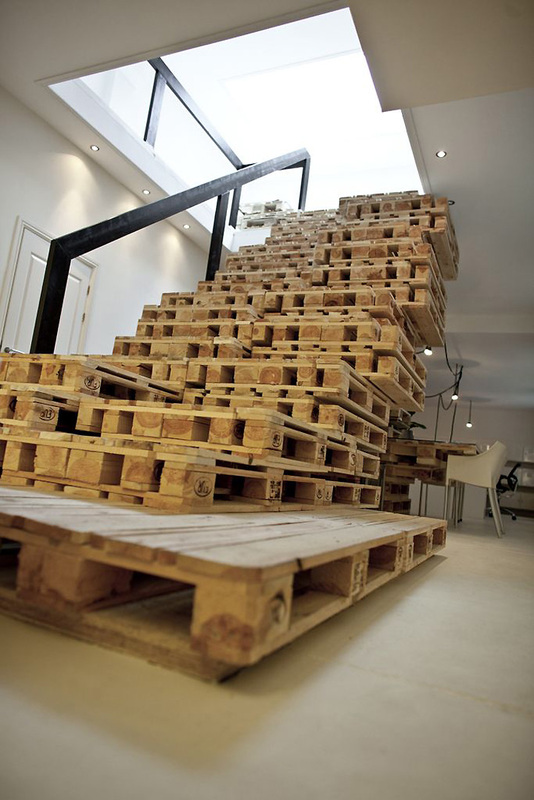 The pallet structure unites the whole space, covering the whole depth of the building in one single movement. The design can loosely be divided into four zones: The entrance area, the staircase area, the split level area and the studio area, in the back of the ground floor. 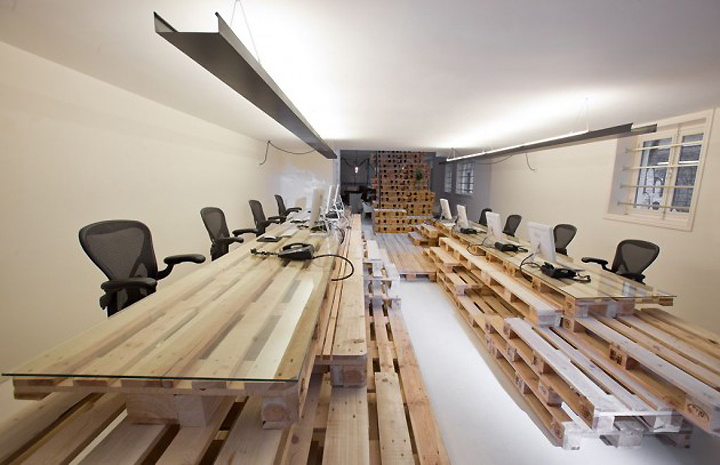 Entrance area: coming in, the pallet structure welcomes its visitors with open arms, created by two rows of desks, providing a total of eight working units on two different levels. Visitors walk onto the pallet structure like a catwalk, surrounded by BrandBase employees. 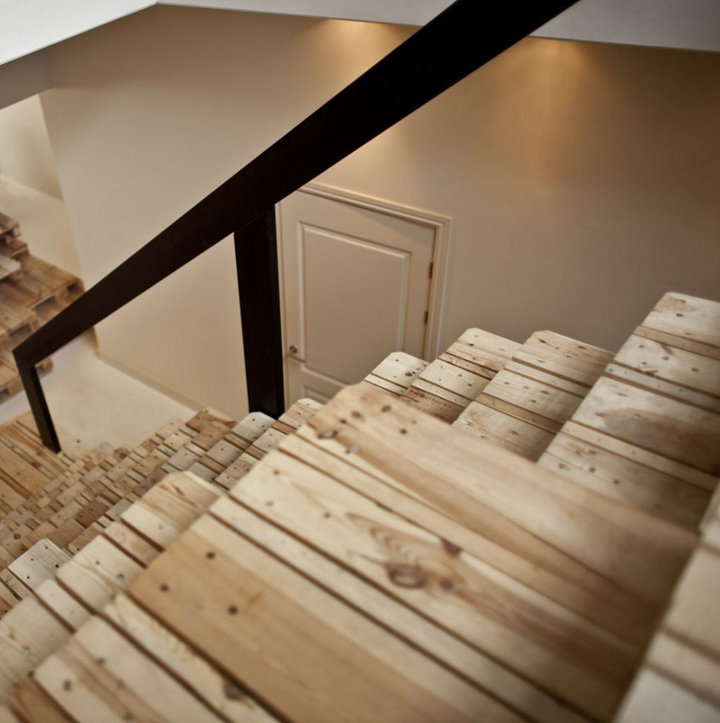 Staircase area: the working units in the entrance area make way for a staircase that is divided in two part; the formal part with its steps and banisters and a more informal part, where stacked pallets provide for a place to hang-out. Split level area: reaching the upper floor, the staircase transforms into the management premises, with a combined presentation- and meeting room. Here, the four desks are designed more independently. 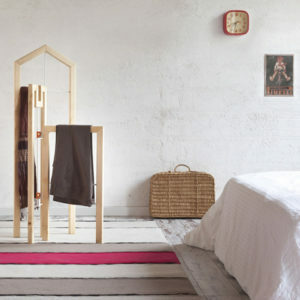 Subsequently the pallet structure, separated by a transparant wall with translucent doors, develops into the presentation room with its seating element that accommodates guests during presentations. 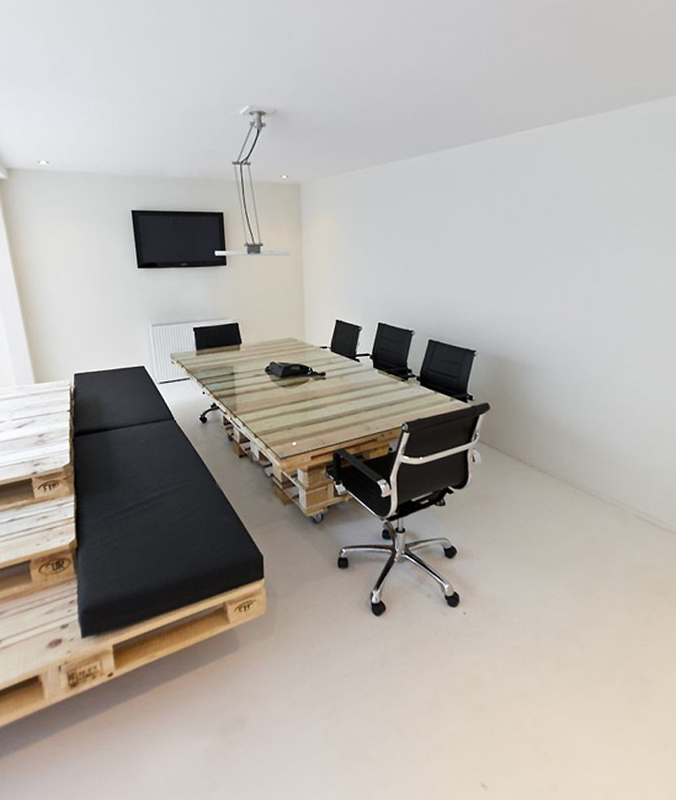 In front of this, a huge movable boardroom table, made of pallets. The studio area: the rear part of the ground floor was dealt with in a totally different way. The efficient positions of the white desks are connected with the pallet structure through black wires, which hang along the ceiling from the staircase to the desks and servers like lianas.